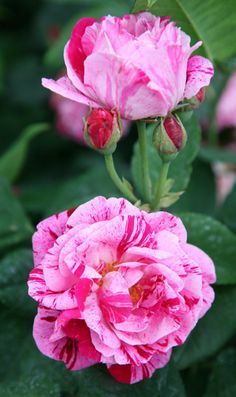 Rosa 'Ferdinand Pichard' - One of the finest striped roses, producing double, pink flowers that are clearly striped with crimson and purple. This hybrid perpetual rose has an upright yet compact form with prickly stems and dark green leaves. It is a good repeat flowering rose with richly scented flowers.